In Brazil, Lycium barbarum L. (goji berry) is an agronomically valuable, imported, commercialized plant. 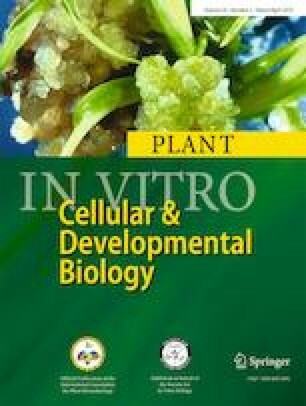 The present study evaluated the effects of cytokinins and light sources on optimization of in vitro multiplication of goji berry by axillary bud proliferation. Nodal explants were excised from plants 90 d after in vitro germination and cultured on Murashige and Skoog (MS) medium containing 30 g L−1 sucrose; 7 g L−1 agar-agar; and 0, 2, 4, 8, or 16 μM 6-benzylaminopurine (BAP), 6-furfurylaminopurine (KIN), or thidiazuron (TDZ). After 60 days, regenerated lateral buds and shoot lengths were evaluated. The regenerated shoots were inoculated in MS supplemented with 0.0, 2.5, 5.0, 10.0, or 20.0 μM BAP under white fluorescent lamps or mixed treatment of red/blue (RB) light-emitting diode (LED) lamps. After 60 days in vitro cultivation, the number of formed shoots, leaf number, and shoot length were determined. Subsequently, the shoots were separated and acclimatized in a greenhouse for 30 d and the percentage of survival was evaluated. High regeneration and shoot numbers during lateral bud regeneration occurred with MS medium plus 4 μM BAP. The estimated optimum concentration of 11.56 μM BAP under RB LED lamp resulted in a high shoot number (8.15), with more average leaves per plant (9.2) at 5 μM BAP, and longer shoots (12.34 cm) at 12.42 μM BAP. Acclimatization was successful with 100% survival of ex vitro plants. An efficient in vitro multiplication protocol of an economically important species, goji berry, was developed to facilitate large-scale commercialization of this species. The authors are grateful to the Conselho Nacional de Desenvolvimento Científico e Tecnológico (CNPq; Brasília, DF—Brazil), Fundação de Amparo à Pesquisa de Minas Gerais (FAPEMIG; Belo Horizonte, MG—Brazil), and Coordenação de Aperfeiçoamento de Pessoal de Nível Superior (CAPES; Brasília, DF—Brazil) for financial support.